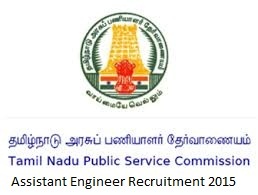 Tamil Nadu Public Service Commission (TNPSC) has invited online application to fill up Assistant Engineer (AE) posts in Tamil Nadu Highways Engineering Service (Highways Department). Candidates who are eligible and interested they can apply online mode by visiting official site of TNPSC before 12th August, 2015. Candidates also check other details related to TNPSC AE Recruitment 2015 like how to apply, selection process, syllabus, Govt Jobs in Tamil Nadu, question paper pattern, old question papers, last year question papers, model question papers and more details check below. Educational Qualification: Candidates must have passed B.Tech in Civil Engineering any recognized University.